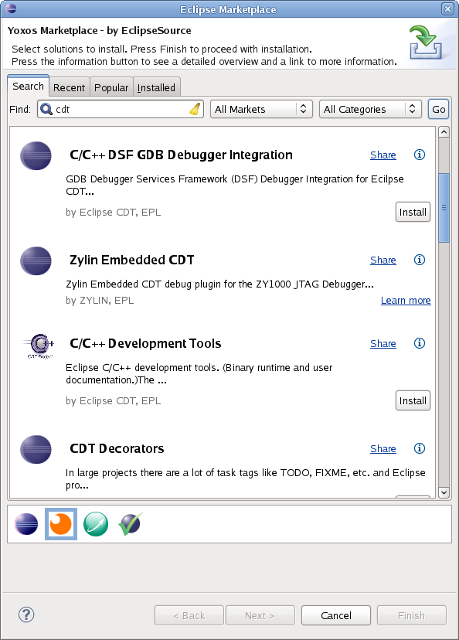 Special versions of eclipse exist that come with the already installed plugins as eclipse-cpp-mars that is the eclipse mars version with plugins installed for cpp. Using such a version as a quick start is therefore recommended. Eclipse binaries come with everything required and run from their directory where unpacked. There is no must to have them installed by a packet manager (however if hassle free available a packet manager is recommended). Building eclipse seems to be a pain. The versions in gentoo Linux but also in its overlays are usually old and do not work anymore. Once installed, the next hurdle comes. How to install the plug-ins. There are different ways. If you are lucky you find under help eclipse marketplace (if not, you find it under General Purpose Tools to be installed using the next installation method). There are many marketplace servers. so you might need to configure that too. Finally under Help> Install New Software opens a window, where a software site needs to be entered. If nothing is there then adding a name as Juno for the version and a link to it as http://download.eclipse.org/releases/indigo/or http://download.eclipse.org/releases/juno/ will do the necessary work. Many names of software are is not consistent, so it might easy be confusion on what has to be installed and what is already installed. The install software window has a link already installed that gives an overview on what is already installed. To get support for C, the CDT (C Development Kit) needs to be installed. This is good to know, but the link to the Available Software site would be more helpful to know. So Google for CDT or use the eclipse market place will eventually find it. The problem is there are many tools that are made for CDT so you might end up installing such a tool instead of the CDT. Eclipse puts all its stuff in a directory that you have to select at first start this directory is called the workspace. Inside this directory all projects that you have done. But there is also a .metadata subdirectory. Import allows to include a directory into the eclipse workspace. Luckily Linux is a relative clean operating system, so all plug-ins downloaded and installed go into ~/.eclipse and within this directory subdirectories for different eclipse version exist. So it is possible to have multiple eclipse versions installed, but be aware to create multiple workspaces otherwise the .metadata will become corrupt. Additionally the plug-ins might create directories as ~/.android that could become messed up when having multiple eclipse versions with the same plug-in. So it is probably better to create different user accounts. If nothing shows up in the Install New Software window or if marketplace has some dependency issue then the .metadata subdirectory in your workspace might be corrupt, so delete it, this will force eclipse to recreate it.